If you ask just about any parent about the most important things in their lives, you’ll be hard pressed to find a mom or dad who doesn’t put family up at the top of their list. Ask a group of teenagers the same question, and a good portion might forget to even mention family! Well, those are the stereotypes, at least. We didn’t do a poll to back up our hypothesis, but we still would say it’s a safe bet that parents, more than teenagers, realize the importance of family — and for that matter, spend quality time with the family. Not to worry, however: you know that broody teenager who would rather stare at their phone for twenty minutes on end than make eye contact with you for two seconds? They’ll grow out of their general ambivalence, sooner or later. But you might have to wait years for that to happen. By that time, they’ll be in their late twenties, married with children, and they won’t have anytime for you, then, either. Maybe we are being a bit pessimistic here, but we have a point! The point is this — it’s time to connect with your moody, broody teen where they are at. And before you, the parent, tell us that you’ve tried connecting with them every which way to no avail, here us out. Have you tried zip-lining in a forest with them? Now before you list the knee-jerk excuses you think they’ll come up with for not wanting to join you on an aerial adventure in Grand Rapids, please take just a few more minutes to read the remainder of this blog! As the title of today’s post already gave away, this two-part series is all about why family time matters, and how you can get your kiddos to genuinely enjoy the quality time you spend with them! It might take some outside-the-box thinking, but we are confident that we can help get you motivated to motivate them to have a great time…if you follow us! For the remainder of part one of this two-part series, we’ll say a brief word or two about what we offer at TreeRunner Grand Rapids Adventure Park. All the above happens while being safely suspended in the tree canopy. We adhere to all strict standards put forth by the Association for Challenge Course Technology (ACCT) and the American Standard for Testing and Materials (ASTM), so you can be assured of your family’s safety when you come to visit our outdoor adventure park! 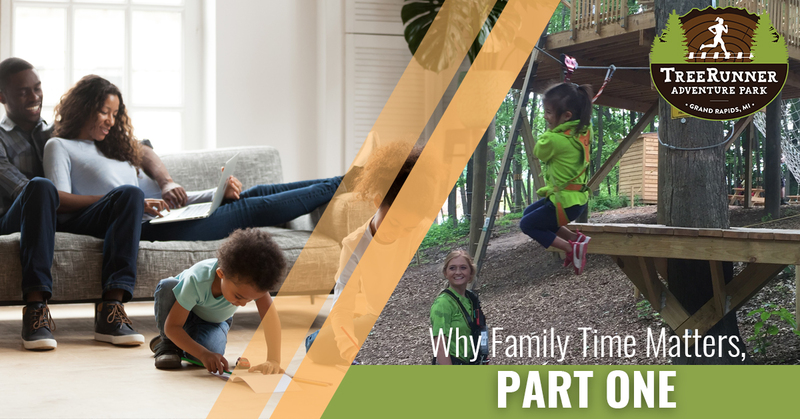 In part two, we’ll highlight a few specific benefits of family time. No matter what kind of family time you end up having, the important thing is that it is you are all together. But at the end of the day, the memories you’ll cherish the most are the ones that bring you out of your comfort zone. You can find the perfect blend of challenge and fun at our aerial adventure park. And don’t worry if you lack climbing experience — it’s not necessary to have any! Keep in mind we offer a Junior Park, specifically designed for kids as young as four years old. Book your treetop adventure in Grand Rapids, and be sure to look out for part two in the near future! We’d love to hear from you and help make sure your family has a wonderful time together at our aerial forest park!